It’s been pretty well known for the past few days that Google is intending to release a 7-inch tablet today at its I/O developer conference. The Asus-manufactured device is aimed directly at the Kindle Fire’s market share, and its $199 price point puts it as a strong contender from day one. The image for the tablet is reportedly coming directly from the Google Play servers, where the device will likely be available for ordering. 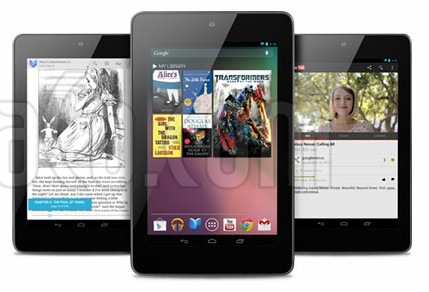 It’s expected that the Nexus 7 will run Android OS 4.1, codenamed Jelly Bean. We don’t have any definite specs on the tablet just yet, but rumors peg the device as having a 7-inch 1200 x 800 IPS display, 1.3GHz quad-core Tegra 3 processor, 1GB of RAM and 8GB or 16GB of internal storage. We’re live at Google I/O today for the keynote, so make sure to follow along with our live blog to catch everything as it happens.